By all accounts, Polly Jean Harvey is a dynamic and electrifying live performer, with highly individualistic talents as a rock musician, singer and songwriter. Please Leave Quietly is her first ever DVD release, and features 16 tracks (including favourites like: Meet Ze Monsta, Down By The Water, Big Exit, Harder, Victory, Catherine, and The Letter) recorded during her 2004 tour, ostensibly promoting that year's studio album Uh Huh Her. 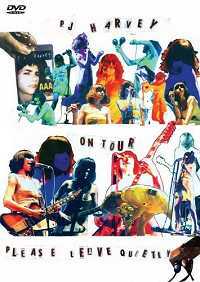 Purposely eschewing the slickness of many filmed concerts, this aims (and scores) to reflect the more disjointed and 'ramshackle' aspects of touring. Assembling raw 'lo-fi' DV camcorder clips and professionally shot footage, mixing and matching intimate backstage scenes, whimsical urban travelogue, Q&A spots with Harvey's band, and tellingly introspective moments, in a suitably bewildering variety of images used as montages bridging the songs, this haphazard expressionist approach gives music fans insightful glimpses of Harvey's 'on tour' experience. Consummate stagecraft and blatant theatrically squats, often uneasily - it must be said, alongside the post-punk attitudes favoured by this rapidly maturing artist, but it all combines to complement Harvey's edgy demeanour and sheer unpredictability. The inclusion of randomised snippets from various gigs for almost every track means that Harvey's varied stage wardrobe makes for a wickedly effective parody (is this our rock heroine's considered response to those infamous Take 3 Girls 'tribute' CDs from Cher and Madonna and Kylie?) of the multiple costume changes every self-respecting pop diva aspires to as hypothetically glamorous support for their shamelessly limited repertoire. And, of course, all the cut-and-paste spontaneity of concert director Maria Mochnacz's informal editorial technique extends to the pleasantly cheap and cheerful aesthetic of packaging design, and sympathetically contributes to the remarkably down-to-earth agenda of Harvey's phenomenal appeal, on the levels of bruising erotica and modern romanticism, in the chaotic arena of gutsy feminist rock stars. The only DVD extra is Harvey's entertaining half-hour interview. She talks candidly, honestly and wryly about her working philosophy and influences, but anyone who's expecting an interrogative expo is likely to be disappointed, because Harvey refuses to clarify much of anything about her notable eccentricities, and prefers to leave her music open to whatever interpretations the viewers and listeners might place upon it.